Why should a quality image editing software include both a Crop and an Auto Crop feature? It's a legitimate question and we heard it from some of reaConverter's users. And the answer is really simple: because the Auto Crop tool makes cropping even easier and quicker to do. With Auto Crop you no longer have to enter a set of figures that define the cropped area, but simply pick an option from a dropdown menu. It saves time and effort, and it's great to use especially when you want to apply basic cropping to a large a number of images. From the first click to the last one, it might take you less than a minute to do the entire operation — and we have a video tutorial below to prove it! 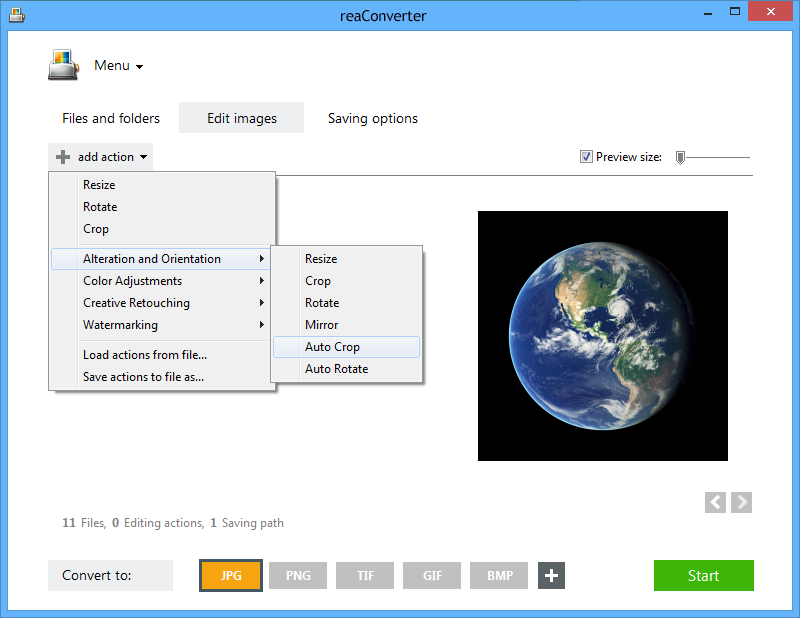 Add all the image files you intend to crop, either by browsing your computer or using the drag-and-drop tool. Alternatively, you can add entire folders here, or load images from a .txt file. Go to the Edit images tab, press the Add action button and pick Alteration and Orientation from the dropdown menu, and then click Auto Crop. Now you will be able to easily detect the area you intend to crop by selecting the color of pixels from the top-left, top-right, bottom-left or bottom-right part of the image. Or by selecting one particular color using the handy color picker tool directly on the preview image. Here you can also enter a particular color tolerance, if you like. 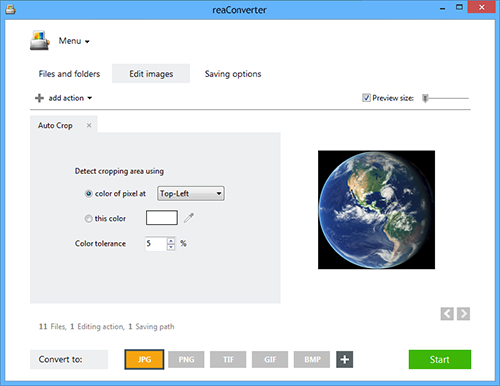 In the Saving options tab, you will find several possibilities in terms of locating your cropped images. Choose a local folder, your could-service account or several other options. Then decide if you want to preserve the initial format of your images or convert them to another one by simply clicking the extension buttons conveniently placed at the bottom of your window. After this is done, just click Start and your cropped images will be ready sooner than you expect! where "tl", "tr", "bl", "br" mean Top-Left, Top-Right, Bottom-Left, Bottom-Right. Command-line auto cropping tool is an advanced feature meant for professional use, and is available in Pro edition only.